Whether you're tapping 50 trees with buckets or 1,000 with tubing. CDL has what you need! 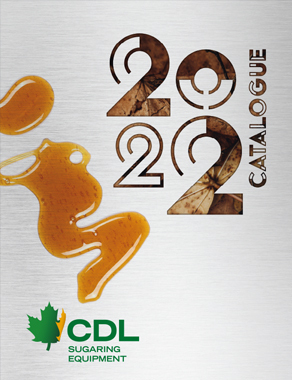 Learn more about CDL’s wide range of fittings and spouts to improve your sugarbush profitability and meet your maple production needs. Spinseal is a revolutionary system for installing fittings on mainline in record time. It is the CDL way to save time and money for maple producers. CDL’s wide range of tubing, mainlines and electrofusion will certainly meet the needs of your maple sugar business. CDL’s wide range of tools, wires, drill bits and tapping accessories are perfect for any kind of work you have to do in the forest. CDL’s monitoring maple management system is simple and gives you complete control of your sugarbush. Better productivity and increased profitability. Look at CDL’s wide range of fittings, valves and plumbing available in different sizes. These pieces can be very useful for any type of work. Learn more about CDL’s wide range of extractors, moisture traps and vacuum tanks. Learn more about CDL’s vacuum pumps. Durable and easy to maintain, these pumps could increase gain per tap. Learn more about CDL’s tanks and accessories. Many models available for any type of sugarbush. CDL concentrators and membranes are specially designed for maple producers needs. Learn more about it! Learn more about CDL evaporators and accessories. Available for small or big maple producers, you will certainly find what you need. Learn more about CDL filter presses and CDL filter press accessories to maintain a proper functioning during this filtration step. The CDL barrels and processing equipment will allow you to transform your syrup simply, so you can pack it properly and quickly. CDL has various products. Food, cook books, storybooks and how to books.